Or also know as Saint Nickolais here in Belgium. It’s a special day for the kids on December 6th each year. It’s like the Santa Claus that is coming at night and bring toys. And by a ‘little bit’ I mean a little bit because it’s kind of long story. Nickolais was a bishop in Myra a place in Turkey. He died on december 6th in the year 342 (so a loooong time ago). Most of the historical things are now gone, but a children feast is still staying and celebrated. He’s an old man dressed in red and white and have ‘guys’ that help him deliver toys and candy to kids at night. All with his white horse ‘bad weather today’. So in Belgium it’s the tradition that kids are getting a present from him on December 6th (December 5th in the Netherlands). 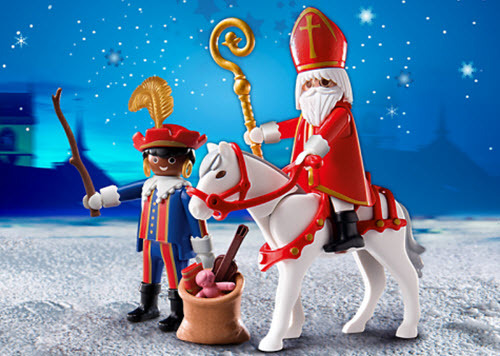 Sinterklaas is living in Spain during the year to ‘make’ and collect all the toys and candy (chocolate figures). On a Saturday half November (mostly around the 15) he will arrive in Belgium with a boot (steamer) in Antwerp. Or just give the list to one of the visits the will go to or put the list near the fireplace together with their shoe. 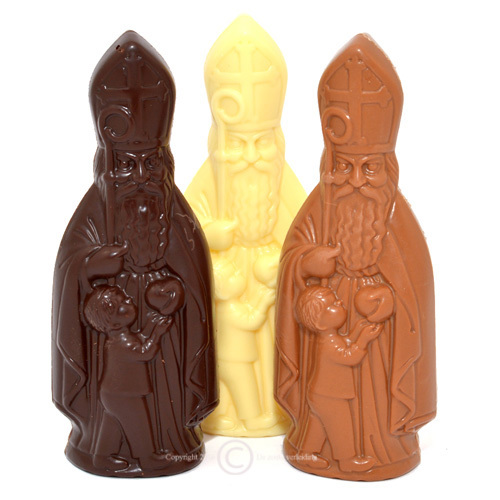 Sinterklaas will pick it up when it’s in their shoe, and give some chocolate. A few days before or mostly on the night of December 5th, kids have to set their shoe again near the fireplace with a carrot or sugar (for the horse), beer, cookies. The next morning kids will find their presents around their shoes and ofcourse (it’s Belgium) with a lot of chocolate. Sinterklaas, when I was young? Most kids here know the story about Sinterklaas when they are about 10 years old. I knew the story when I was 5. Maybe that’s the autistic part of me (wasnt diagnosed at that age) that thought I could not be true. One man, a horse and some guys delivering toys and candy all over Belgium in just one night? Oh and I never got what I asked for maybe that’s also a reason why I stopped believing in it. Now I see 11 year old kids that don’t know the whole story yet, and still believe that this is all real. It’s so confusing for me, and it’s so hard not to tell the story to my niece who is 11. I just don’t get it, maybe she pretends that she believes so she still get her presents. How I feel about this day? Like in the end of the 80’s and beginning of the 90’s, it was a nice party. Sinterklaas only brought small gifts and not the expensive things like a new Playstation or Nintendo. If you get a Barbie toy set or Lego train you were spoiled. Now, the last years … it’s the bigger the presents are the better 😮 So shocking to see. Most parents I know give at least 150 or 200 EUR per child for their presents. I mean WHAT ??? Okay, he only comes once a year but than giving that amount of money is so wrong. I can imagine that this child will be going to school and tell about his/her amazing gift he/she got form Sinterklaas that morning. Most people forget that not every family can give such big presents to their kids. So what about the kids that only got one doll or a game, worth less than 20 EUR because they don’t have that amount of money to spend on gifts. It’s kind of unfair that Sinterklaas is making differents in his gifts to kids and (in their eyes) is giving much better presents to a few. For me it’s just sooooooo terrible wrong ! But hé, who I’m I right? Here in Belgium it’s still a big buisiness each year, it’s more about the money than about the real thing of celebrating with your kids. Around 25 years ago, (I already knew the story) we had a special tv show about Sinterklaas ‘Dag Sinterklaas’. It started 7 days before the 6th of December, and 5 December was the moment Sinterklaas was leaving on tour to deliver the presents and leave for the rest of the year to Spain. Here’s one of the episodes, it’s still on tv each year, even after 25 years it’s still HOT and people still love it. Besides this television show we also have special movies about him or about the presents. After December 6th, when Sinterklaas is back to Spain, most people put the Christmas tree in their house for decorating. Every year we also have waited till after December 6th, but this year I haven’t been waiting and have my tree for a few days out. The next days, kids and adults will be eating (and preparing) a lot of chocolate figures. That’s one tradition I will be going to follow tomorrow morning ! Belgian girls and their chocolate, right ? Till tomorrow for a new blog ! It’s going to be a bizzy day because I’m going to make a trip to Brussels but not to the city for shopping? What else? Well, till tomorrow on Twitter and here!